In the tradition of the Lithuanian Franciscans, we invite you to enjoy our hotel buffets and hope you leave with a full stomach! 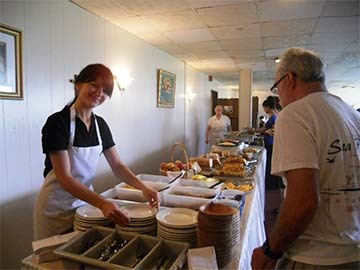 We offer the breakfast buffet except for Thanksgiving and Easter Holiday weekends. We also offer dinner buffets on select evenings – call 207-967-4865 for more info. 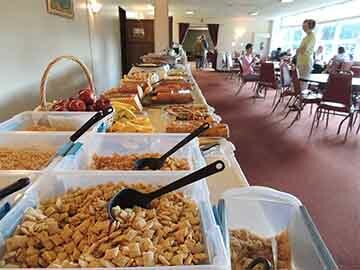 For the continental breakfast, you will find many options starting with a choice of 5 different cereals. Then there is a wide assortment of breads that usually contains bagels, sliced breads for toast, and during the summer months there are often baked Lithuanian breads. Boiled eggs, fruit, coffee and juice are also included. For the full breakfast buffet, we offer hot eggs, oatmeal and pancakes or French Toast with syrup, cinnamon or brown sugar. During the peak season, we often have Lithuanian pancakes (Blynai) or French toast. During some weeks, homemade Lithuanian farmers cheese (Ukininku Suris) is also available. To drink, we provide orange juice, ice water, coffee, tea, milk, and hot chocolate all included with your stay. During the peak of summer, a buffet dinner will sometimes be offered to guests. Please inquire for details. Our cooks make both American and Lithuanian dishes. Our American meals are basic but filling. In peak season, the homemade Lithuanian meals are made by our Lithuanian cooks. A typical dinner buffet may include a garden salad, soup, bread, entree, rice, pasta or a potato dish, one or two cooked vegetables and a light dessert. Some of the Lithuanian dishes served include Cold Beet Soup (Saltibarsciai), Hot Beet Soup (Karsto Runkeliu Sriuba), the national dish of Lithuania (Kugelis) which is a savory potato casserole. Some American dishes that are served include lightly seasoned baked haddock, baked chicken, and pot roast. Beverages often include iced tea, lemonade, water, coffee, tea, milk. A soda machine is available, or you may bring your own beverages to breakfast or dinner. Please note: menus may not match the descriptions exactly and may change without notice. Hotel Room Guests Payment: The continental breakfast is included with your stay. The hot breakfast upgrade can be paid at the front desk. Dinner is paid at the front desk. Outside Guests: Please come to the front desk to purchase tickets for breakfast or dinner. Limited seating.